Yesterday I took 51 turkeys to TFC Poultry in Ashby, Minnesota — the only USDA certified/licensed facility in Minnesota for small farming operations. The DIRT GROUP participants have been helping to raise them since May and now will each receive a turkey to give to their families for Thanksgiving ! They are also donating 10 turkeys to a community outreach program to help feed people in need–making a difference, paying it forward. They have donated nearly 1000 lbs of garden produce to local food shelves as well this season!! Talk about a ripple effect! 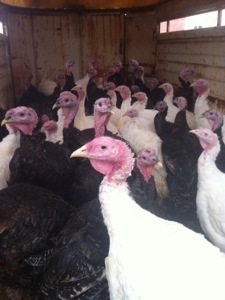 The picture here is of the turkeys yesterday. Today we processed pumpkins we grew for pumpkin pie and canned the last of the tomatoes as we prepare for our Harvest Banquet Celebration on October 27th–our youth are AMAZINGING! This entry was posted in education, mental health, social work, Uncategorized. Bookmark the permalink.